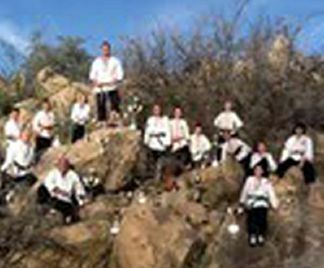 Shinpu-Ren students and instructors returned to Prescott Valley with 89 Top Four National Positions. There were a total of 27 National Fist Place Titles and 27 second place titles won. Attending the USKA National Championships in Las Vegas Nevada were 21 students and 2 instructors. The tournament was at the LVH Convention Center March 28-30. The youngest competitor was 5-years-old, one of SPRFK's Mighty Mights, who placed in all four of the events entered. Also of special mention there was one Grand Champion winner in the youth competitor divisions. Three of the students Triple Crowned, taking a National Champion Title three times. The annual Kick-a-Thon held at Freedom Station raised enough to donate $1,000 to a local family struggling with cancer. Shinpu-Ren students consistently work at upholding the Bushido code of Justice, Bravery, Benevolence, Politeness, Veracity, Honor and Loyalty in their training, their everyday lives and dedication to the community. 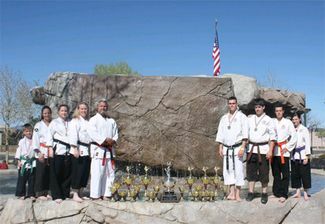 Prescott Valley Karate Champions return home with 6 National Champion Titles and a total of 39 top four placings in the USKA National Karate Championships. Held annually in Albuquerque New Mexico, the top four State and Regional qualifiers from the U.S. are invited to the Nationals to compete for a National Champion ranking. 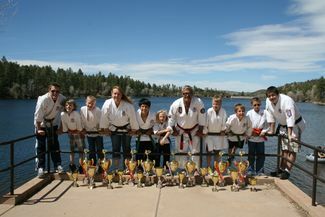 ShinPu-Ren Family Karate attended with nine students and two instructors to compete in this year’s Tournament. Students practiced many extra hours this year for this event since a number of them were going in at new, higher rank divisions, the competition is tough and Champions are made in practice. Competition is two long days of events and runoffs that last late into Saturday evening until all of the Champion Titles have been awarded. As an added special bonus this year, Shihan Alex was honored with an invitation to perform a Self Defense Demonstration with Sensei Fumio Demuras head student. This was completely different from last years demonstration and very exciting to see Shihan flying through the air and over chairs. Shihan and Sensei Travis were also honored to assist in the Bunkai demonstration performed by Mr. Jeff Crothers. Each year students hold a Kick-a-Thon to raise the much needed sponsorship money for entry fees and with each Kick-a-Thon they donate back to the community a percentage of the money raised, to a local Prescott Valley charitable organization. This year the students were able to do better than the usual 10% donation back into their community, and they donated 65% of the proceeds to help out where they felt the money could do the most good here in Prescott Valley. ShinPu-Ren stresses the code of Bushido with the students, “Justice, Bravery, Benevolence, Politeness, Veracity, Honor, and Loyalty. 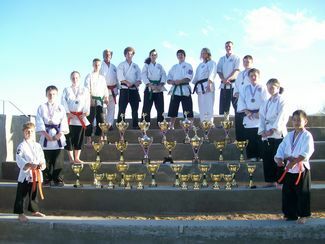 Shinpu-Ren Karate Students bring home the Gold X8. 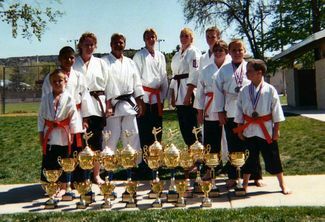 Eleven Students of Shinpu-Ren Family Karate attended the 2012 National Karate Championships and returned to Prescott Valley with Eight National Titles under their Belts. The total number of placings for the team was 38, with 28 of those being in top three. This year was extra special for Shihan Alex as he had the honor of performing in a demonstration for the Nationals audience with the student of Master Fumio Demura- 9th dan of Shito Ryu-The real Mr. Miyagi. The performance was a weapons attack and defense demonstration that had the audience on the edge of their seats. Students also held a Kick-A-Thon to raise the funds for this event and were able to donate $170.00 to the Yavapai-Prescott Valley Food bank as their way of giving back to their Community. This years nationals Team did exceptionally well overall. 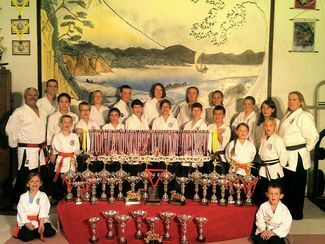 With divisions up to and over thirty competitors, Nine National Champion Titles returned home with the seven students and three instructors of Shinpu-Ren Family Karate. There was a tremendous amount of talent and challenge this year. 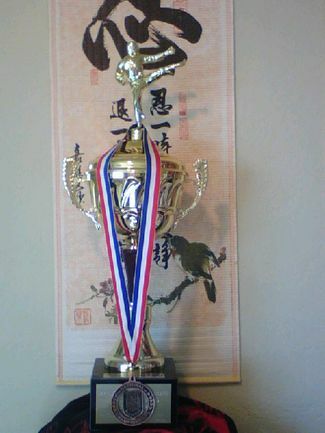 This was also the first year for Shihan Alex to compete in the Masters Division. The youngest competitor on the team Seven year old Ceily, triple crowned by bringing home three titles of her own. Sensei Travis Roach captured two Titles. Overall the ten competitors returned home with 28 top 4 wins. Watch videos for this competition! The team for this years National Championships was one of the smallest and youngest teams the school has ever taken. However what they lacked in numbers and age they made up for in top four placings. Five students and two instructors competed for two days in six different categories of events. The number of Champion Titles matched last years with the team bringing home 5 first place titles. The team also won 5 second place, 3 Thirds and 2 Fourth place wins. Still a great representation of Prescott Valley and Shinpu-Ren Students. This year’s National Tournament was one of the most exciting yet, when a beginning student of Shinpu-Ren Family Karate brought home a Grand Champion Trophy. This is the first National Grand Champion ever for the school. Michael Collins, a 16 yr old student, who had only been training for five months, captured the coveted award for the Kata (forms) division at Nationals. He had taken First in his bracket and then went on to repeat the performance when he competed again against all of the other division title holders for the Grand Champion Trophy. The team brought home 5 National Champion Titles, 15 top four placings and one Grand Champion. If it’s Champions your looking for, then ShinPu-Ren students have once again set the standard. There are a handful of kids here in Prescott Valley that have all the right stuff when it comes to striving for excellence. The ShinPu-Ren Family Karate School returned this week from The National Karate Championships with ten competing students and three competing instructors. Between these thirteen competitors, they brought home 38 top four National placings. First time competitor Tye Garcia, age 9, captured two National titles in Koshiki (full contact fighting) and Kumite(point sparring). 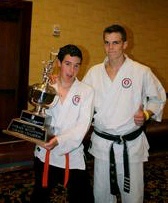 Travis Roach won a national title for kata(forms). Lizz Gill 16, captured National Champion in Kumite. Cody Green age 7, and Corey Walker age 13 both won National Champion Titles for Team Sparring. Hannah VanErt placed National Champion in Kumite. Both Shihan Alex Morris and Shihan Lori Morris won National Champion Titles in Chanbarra (Samurai Sword Fighting). Team “Tatsu” Travis Roach, Hannah VanErt and Nathan Cecil won second place in Team Sparring. The Kata team of Tatsu, Hannah VanErt, Lizz Gill and Travis Roach won third place this year in their first time competing in Team Forms. Other placings were as follows, Maranda Walker-2nd team sparring, 3rd in Koshiki and Kata, 4th sparring. Raider Buttler- 2nd in Koshiki, 3rd in Chanbarra. J.J. Buttler- 4th Chanbarra, 4th Kumite. Lizz Gill- 2nd Koshiki, 2nd Kata. Hannah VanErt- 4th Chanbarra. Corey Walker- 4th in Chanbarra, 1st in Team Sparring. Cody Green- 3rd in Kata. Travis Roach- 4th Kumite, 5th weapons. Shihan Alex Morris-3rd Team Sparring,4th Kumite. Sensei Todd Keightley- 2nd Kumite, 3rd Kata. Shihan Lori Morris-3rd Kumite. Now that’s a great representation of the potential of the kids here in Prescott/ Prescott Valley. Shinpu-Ren Students return from the USKA National Championships with a total of 38 National placings and 35 of those were top four! This year’s team came home with 10 National titles under their belts. The team of twelve competitors competed in six different events. The events were as follows, Forms- (Kata), Point Sparring- (Kumite), Weapons- (Kobudo), Koshiki- (Full Contact Fighting), Team Sparring, and Chambarra- ( Sport Kenjutsu). The National Championships are held in Albuquerque New Mexico, only the best of the best in the United States attend and compete. In order to qualify those who are invited have to have placed in the top four at either a State or Regional Championship Tournament, also invited back are those competitors who are returning to defend their title from the previous year. Shinpu-Ren Instructor sets the pace for students at The National Championships by winning Four National Tiles. Shihan Alex Morris likes to set a high standard for his students when, at this year’s National Championships he swept his Black Belt division by taking first place Titles in all of his events. 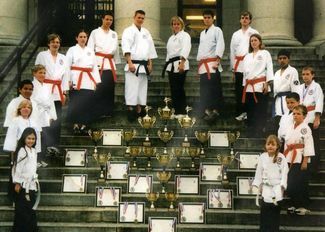 The school had eleven students compete. Out of those eleven, 23 of their placings were in the top four standings. Ten of those being top two. 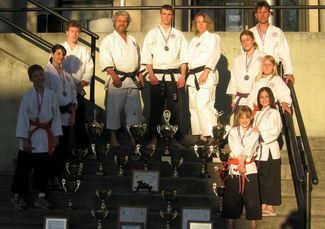 Shinpu-Ren Family Karate cleans house at the 2005 U.S. National Karate Championship’s. 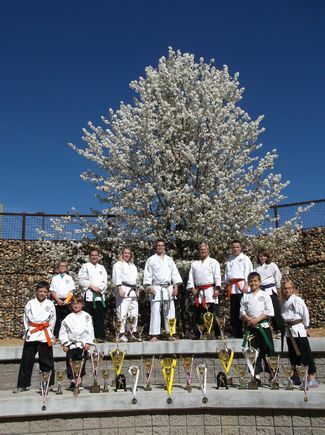 The school took 21 students to Albuquerque New Mexico to compete in the USKA National Championships. Students must qualify in the top three of either a State, Regional or World level in order to be invited to Nationals. This years team made Prescott proud when they returned home with 38 top four placings. Of the 21 students that competed, 17 of them captured top two placings. Nine of those being National Champion Titles. What a tremendous accomplishment for these Prescott kids. 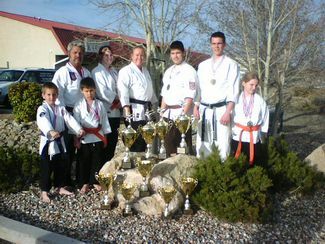 Local karate School Shinpu-Ren Family Karate had 10 of their students attend the USKA National Championships in Albuquerque New Mexico this past March. Of the 10 that attended 7 of them Championed. In all, the students brought home 21 National placings.